Everyone’s got a favorite book on motorcycles. Also, thanks to audio books and Bluetooth communicators, there’s nothing stopping you from listening to a story as you ride. Have you ever ridden that stretch of I-40 from Tucson to Tucumcari? One of these books would have made the ride better. Here’s five books every motorcyclist should read. In the mid-60s, the father of gonzo journalism spent nearly two years riding and reveling with the notorious Hell’s Angels. Thompson paints a vivid portrait of the era, when foreign wars and counterculture movements were gripping the nation and dividing generations. Better, Thompson’s first book (published in 1966) is not a made-for-television family drama. While Hollywood was using melodrama to popularize and demonize the biker lifestyle, Thompson was documenting the scene with an exuberance and verve that would ultimately become his trademark style and, some say, the voice of a generation of writers. Best, it’s a kick in the head to read. Yeah, I know: reading a book to learn how to ride is like watching a circus to learn how to juggle. Still, there’s a lot to be gleaned from those who have been there and done that. And few have been further and done more than legendary motojournalist David L. Hough. Culled from his renowned column of the same name that ran for years in Motorcycle Consumer News, the lessons in this book make for a thorough primer for the beginning rider. If you’ll indulge me an anecdote: When I first started in motorcycle journalism, as an assistant editor at a national magazine (with regional distribution; go figure), a copy of Proficient Motorcycling was one of the first items of swag I was gifted. As my colleagues were trying on brand new gear and planning sponsored trips to exotic locales, “Oh goodie,” I remember thinking. ”A book.” Here I was, stuck in the cubicle with a copy of Proficient Motorcycling and the only demo the boss would, at that point, let me ride: a 250cc cruiser. Yet, between that bike and others, I became a pretty good motorcyclist that summer. Granted, there’s likely nothing in here an experienced rider shouldn’t already know. But, if you’ve got a newbie on your Christmas list, here’s a fine, fine gift idea. If you’re a music fan and you’re reading RideApart, then you’re probably familiar with the heartbreaking story of Neil Peart, the drummer and lyricist for legendary Canadian prog-rock trio Rush. In a 10-month period, Peart’s 19-year-old daughter, Selena was killed in a car accident and his wife Jackie died of cancer. In an attempt to sort out the tragedy, he set out on his GS from his home near Toronto for a head-clearing ride to Alaska. Problem was, by the time he arrived his head was (understandably) still muddled, bitter and angry. So he kept riding and writing, down the western half of the U.S., through Mexico to Belize and back again. Ghost Rider is the moving, heart-rending document of that trip. The story has a happy ending; Peart is still the drummer for Rush, but is also now the author of several books and hosts a rather entertaining (strictly FFO) website, NeilPeart.net. Unlike most other classic rock bands who every other year seem to trot out yet another “farewell” tour, Rush is still playing and recording original music. There’s an anecdote in Matt Crawford’s paean to skilled manual labor where he tells the story of a guy with a leaky faucet. The man calls a plumber and, when the hulking giant gets on his hands and knees and sticks his head under the sink, sure enough the infamous plumber’s buttcrack appears. The man and his wife joke about it — until they get the repair bill. For anyone who’s ever felt hustled first to college then into the cubicle, Shop Class as Soulcraft seeks to restore the honor of the manual trades. Those of us who sit in an office often feel a lack of connection to the material world, and find it difficult to say exactly what we do all day. Crawford points at the advent of the assembly line in the early 20th century and the separation of Thinking from Doing — or, as he puts it, “the work of the hand from that of the mind” — and explains how, because each is reliant on the other, that division saps individual accomplishment from the work being done. If it sounds convoluted, it can be; at times the book admittedly reads like a Master’s Thesis. But here’s the best part, Crawford is a motorcycle mechanic, and he uses examples based on his own experience to illustrate his points. Shop Class As Soulcraft changed the way I think about work, and I’m guessing it will for anyone who’s wrenched in the garage till long after midnight and still dreads going to the office in the morning. If you haven’t red this yet, you should now. In a world filled with boastful around-the-world-on-a-bike books, Jupiter’s Travels was among the first and remains one of the best. In it, Simon recounts 78,000 miles through 45 countries on a 1973, police-spec ,Triumph Tiger T100P, traveling down the length of Africa, north through South and Central America to California. Then he went around Australia and rode overland from Singapore to Europe, planting rugged dreams in the minds of two-wheeled travelers everywhere. You can ask Ewan and Charley: without Jupiter’s Travels, there would have been no Long Way Round/Down. Since first being published in 1978, the book has sold nearly 500,000 copies and spawned the Ted Simon Foundation, a non-profit organization that supports the adventures of overland travelers through resourcing and assistance. 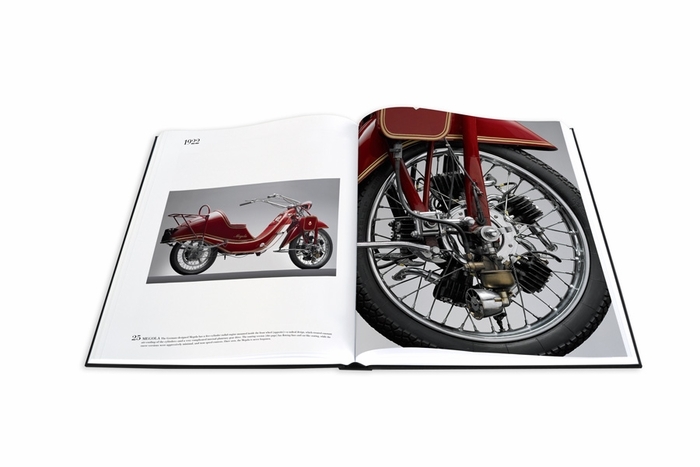 Offering a look at 100 of the world’s most coveted motorcycles, Assouline‘s The Impossible Collection of Motorcycles pays tribute to the engineering and design breakthroughs that define motorcycle history. The luxurious oversized book looks at the evolution of the iconic two-wheeler, and follows its development from a vehicle merely used for transportation into a sleek symbol of speed, freedom and architectural mastery. Priced at a clean $695 USD, the book is currently available atAssouline.